There is widespread discussion today among weather-folks about the low-predictability of the current weather patterns over North America - see Pat Holbrook's comment on previous post. Most attention is understandably focused on Hurricane Joaquin and what its track will be during the coming five days. Current model consensus seems to be that it will hit the central Atlantic coast. Out here in the West there have been large forecast changes - again - in the operational GFS forecast during the past 32-hours. Above map shows the 60-hour precipitation forecast by the model for period ending at 5:00 pm MST next Monday, October 5th. 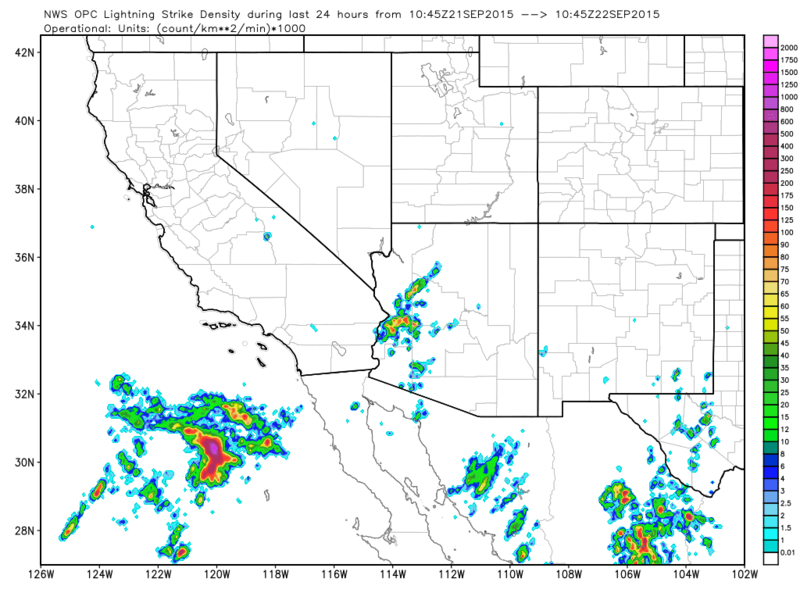 In that forecast Arizona experiences a significant, early October precipitation event. However, the same forecast ending at same time from the 12 UTC GFS run this morning (below) leaves Arizona high and dry. There are other regions with changes that are huge - as per the Southeast and Northwest US changes in the forecasts. The new ECMWF does seem to indicate some precipitation in Arizona over the weekend into Monday - but details are unknown to me. Umbrellas in-hand for Sunday and Monday? this far out flip a coin, given the current pattern. Finally, the CIRA blended PW analysis for 2:00 pm this afternoon (below) shows that high PW continues to lurk on both sides of Baja, only about half way down the GoC - how far north will it come? Comment from Mike Leuthold this morning - The 0z WRF GFS has some interesting weather for Arizona by Sunday with as much as 6 inches of rain along the border by Tuesday afternoon. 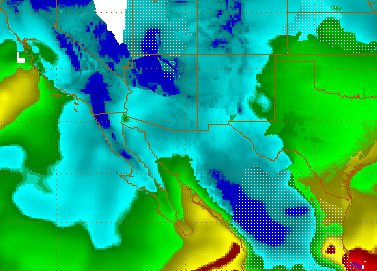 Forecast above shows the model's forecast of accumulated rainfall through 5:00 pm MST on Tuesday afternoon, October 6th. Since yesterday the ECMWF forecast for the 500 mb pattern over western U.S. has remained fairly stable, while the GFS 500 mb forecasts have undergone very large dForecast/dTime - above and below are the 144-h operational-member forecasts from 00 UTC last evening valid at 5:00 pm MST Sunday afternoon. Compare the GFS forecast (below) with the earlier one shown in previous post. There are still substantial differences in the forecast strength of the 500 mb systems - both over the East and the West. The closed low forecast over California is 150 to 200 m deeper in the ECMWF forecast, while the GFS is stronger wrt the East Coast short-wave. Both features are interacting with tropical disturbances, and the attention in the East revolves around how the short-waves in the westerlies will interact with TS Joaquin. The model differences are very large, with the GFS bringing remnants of Joaquin ashore over the Northeast, while the ECMWF scoots Joaquin rapidly off into the open Atlantic. These systems will possibly be heavy rain producers both in the Southwest and the Northeast - the GFS forecast shown below is for 60-h precipitation ending at 5:00 pm MST on Monday afternoon. Lots to watch through the coming weekend, and 144-h is still a long way away. While the coming week will be dry and hot, the weekend is interesting in that there is a very large difference between the operational, 168-h forecasts from the ECMWF vs the GFS models. All forecasts here are for 500 mb at 168-h (valid at 5:00 pm MST on October 4th) from the 00 UTC forecasts last evening. The ECMWF forecast (above) indicates a strong, closed low over California, while the GFS forecasts a significant, bent-back ridge extending from Baja north and northwestward across Alaska. The ECMWF also forecasts a low-latitude, short-wave trough to our south, while GFS anticyclone has any such features blocked and kept at low latitudes. The weather associated with the forecasts would be quite different, of course. The GFS spaghetti plot of its ensemble forecasts (bottom) indicates low predictability out at 7 days, shown by the mess of "spaghetti" that extends from the northeast Pacific eastward all the way across Europe. I don't have access to similar charts from the ECMWF, although they are available to some. Will keep an eye on how these forecasts evolve during the week. 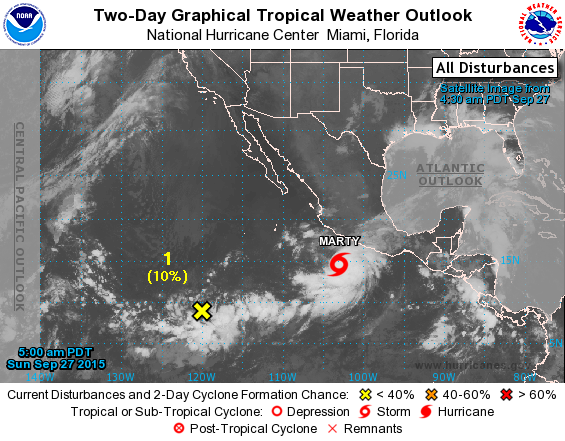 Tropical Storm Marty has developed south of Mexico, as shown above (from NHC). The IR below is from 12 UTC and indicates that Marty's cloud shield is centered around 15 N and 122 W. the current forecast from NHC (at bottom) indicates that Marty will briefly become a hurricane, but then be sheared apart before making landfall. 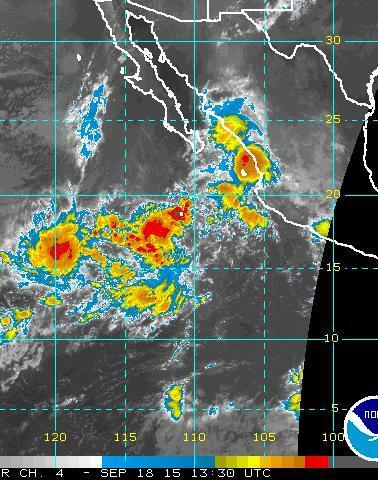 This leaves a low-level, remnant depression moving westward, away from Mexico. 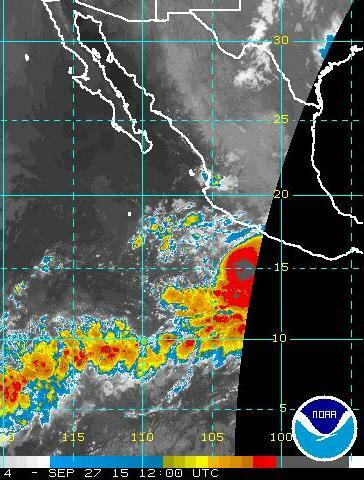 The storm gets close enough to Mexico that heavy rains and flooding will be a concern. Sporadic and erratic winds from east have been surfacing in spots this early morning. Above plot is wind with gusts in red from MesoWest at about 4:00 am MST this morning. 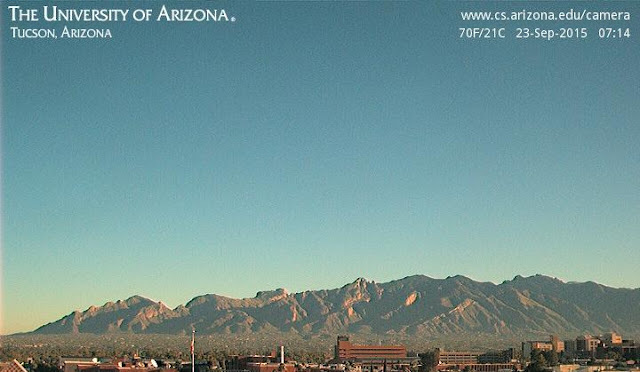 I see that DM AFB reported gusts to 35 mph around 2:00 am and several of the RAWS sites have gusty winds, as per: Guthrie 42 mph; Sollers 36 mph; and Saguaro 31 mph. Winds here along the Rillito seem to be gusting in the 20 to 30 mph range. Not much to write about as we head toward the end of September. The WRF models run at Atmo continue to forecast gusty east winds across southern Arizona later tonight into tomorrow morning, and then again Friday night. The forecast above is from the 06 UTC WRF-NAM and is for 10 m winds valid at 10:00 am MST tomorrow morning. The next tropical system is forecast to go ashore along the southern coast of Mexico - so enjoy our pleasant, but warm weather this weekend. Today (Wednesday, September 23rd) has dawned clean and crisp and clear - as per view above at 7:14 am MST. There were isolated strong storms around the Tucson metro yesterday - Ron Holle sent the photo below, which was taken at Vaisala - just a bit north of the airport. Plot of detected CG flashes (above, from Vaisala and Atmo) is for 24-hours ending at midnight last night - considerable thunderstorm activity yesterday as weakening short-wave elongated to the east-northeast and trailed slowly across southern parts of state. The airport area took a direct hit from a strong storm, as per the surface observations below, a bit before 2:30 pm - Ron Holle's photo is of this storm. This storm apparently produced 1 inch hail and gusts around 60 mph on the far east side of town. Across the ALERT network 62 of 92 sites measured rainfall yesterday from the showers. Amounts were about evenly split above and below 2/10ths of an inch - only 4 sites had rainfall of more than half an inch. Here at house we had two light showers, and perhaps thunder, that produced only 0.02". This morning the Rillito was flowing for the third consecutive day (below is flow measured near Dodge Street bridge), and Sand trout were finning happily in the current. These elusive fish (a variant of the German brown trout - bottom) are hard to spot because they blend perfectly with the muddy color of the stream. Yesterday was dominated by the warm rains associated with the remnants of TD-16. The CG flash density plot above (from Vaisala and Weather.Graphics) shows flashes through 5:00 am MST this morning - thunderstorm activity remained well to the south and west of our part of the state. Most active area was out in the Pacific with the separate, 500 mb closed low. 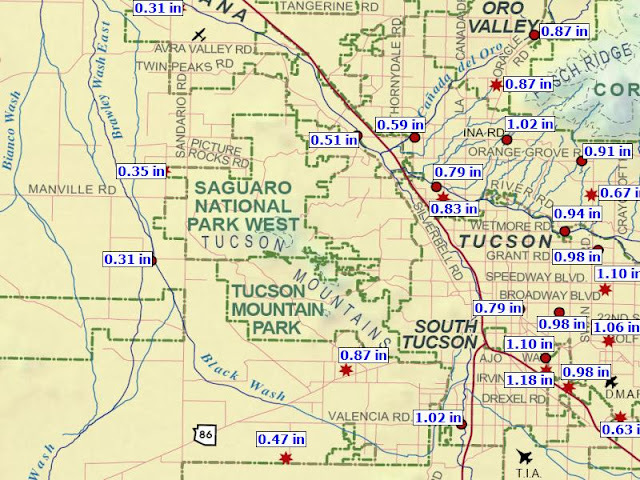 Rainfall was very heavy during the day yesterday, as indicated by the ALERT sectors shown here - metro east above and metro west below - heaviest rains in these sectors fell in Redington Pass area and the Rincons, but amounts near or over an inch were common. Here at house we measured exactly an inch, with the event over by around 3:00 pm. Amounts in other sectors included 6.42" at the Mt. Lemmon site and 3.27" at Florida Canyon in the Santa Ritas. So, the subtropical component of the event was a very effective rain producer for the southeast corner of the state. I grabbed 24-hour rainfall from MesoWest (below for period ending at 5:00 am) but the scaling is not very good. 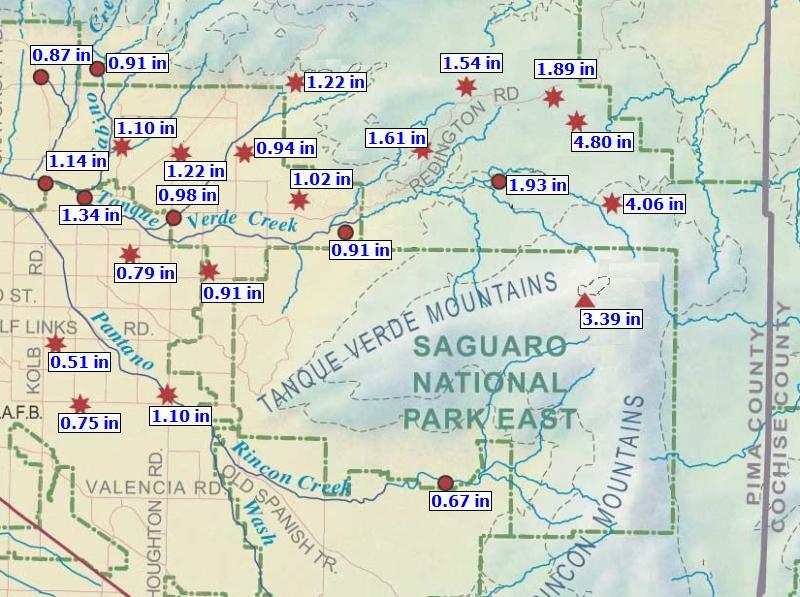 Because the models were quite variable on the location of the swath of heaviest rainfall, I wanted to show that the model forecasts that focused on eastern Pima, Santa Cruz, Cochise and Graham Counties were clearly the winners. If you were in Ajo or Picacho, this event seemed similar to mid-September last year, when the remnants of Hurricane Odile dumped on Cochise and Santa Cruz Counties but left Tucson metro high and dry. The NWS guidance on Sunday, see earlier posts, jumped on the western track for the heaviest rains and have so far been mostly a serious bust - but the final day of the event will be tied to the progress of the 500 mb short-wave across central and northern Arizona, so all the returns are not in yet. Plot of CG flashes through 12 UTC above (from Vaisala and Atmo) shows that thunderstorm activity has so far remained well south of the border. However, large complex with very cold cloud tops (IR image below, also for 12 UTC) is moving northward toward southeastern Arizona. Composite radar display from KEMX radar (NWS TUS) above is for 5:33 am MST. Rain has just inched into the far south edge of the ALERT network, with one site (Arivaca) reporting 0.04" through 5:00 am. I grabbed two radar images from College of DuPage's radar page (more and better products there than at the NWS local web page) to illustrate some problems with tropical rain events, which produce much rain at lower levels through warm-cloud processes. Above is the 1242 UTC 0.5 degree (base) scan showing the huge problems with terrain blockage across much of the southern half of the radar domain. Below is the 1237 UTC echo-top product, which shows a patch of echo southwest of radar with echo tops to 20 to 30 thousand ft MSL - quite a bit of this echo area is within the terrain-blocked region. Above is the morning forecast for TD-16E from NHC - which indicates the weakening depression may move right across eastern Pima County. As Mike mentioned yesterday afternoon, the models continue to forecast considerably different outcomes for this event. These two forecasts are from the 06 UTC runs of the WRF model at Atmo and show forecast rainfall through 5:00 am MST tomorrow morning.. Both the NAM (above) and GFS (below) versions now are forecasting the max rain area to occur over or just east of the Tucson area. The NAM version has a much more broad event that impacts all of southern Arizona and southwestern New Mexico. But, the GFS forecasts a much heavier band of rainfall across southeast Arizona, with less rainfall to both the west and east. We will have to switch into observing mode and watch how the details evolve today. How Wet Will It Be? First a brief summary of yesterday. The WRF-NAM forecast that I posted on Friday (valid for yesterday) was indeed very optimistic - but each run that followed forecast less and less chances of storms at low elevations. There were storms around yesterday - above image shows heavy rain shaft south-southeast of Kitt Peak and 24-hour flash density chart below (from Vaisala and Weather,Graphics for period ending at 6:00 am MST this morning) shows that storm activity shifted westward again on Saturday. 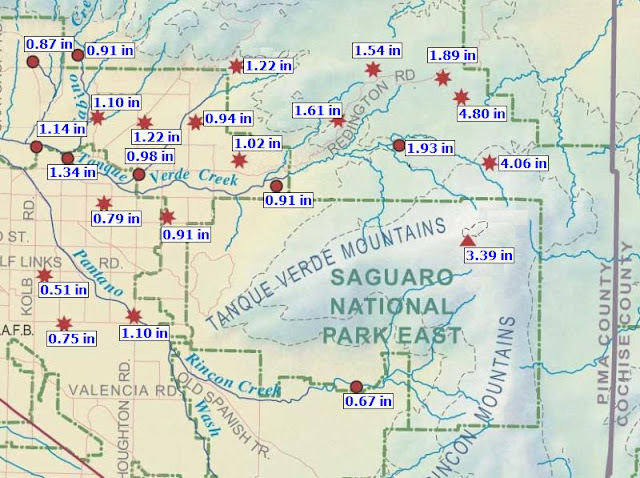 Across the ALERT network 10 sites measured rainfall - these were at high elevations and around the southern edges of the network - Keystone Peak (west of Green Valley) had 0.83" and Mt. Lemmon came in at 0.35". The NWS POPs on Friday were actually pretty good for yesterday - looks like the low-elevation zone had zero coverage (although there were strong outflow winds and a bit of dust) while coverage for the high-elevation zone was probably about 50 percent. For today the WRF forecasts little storm activity this side of the border. But then the situation turns wet as the subtropical disturbance approaches for the south-southwest. The forecast above from NWS is for the airport grid and has very high POPs for Monday through Tuesday. Below is a weather story graphic for this morning's forecast - note the confidence statements. I think this is a very gutsy forecast, since it is essentially based on the model forecasts for a feature that is heading our way out of an observational data void. Those who have been around the Southwest very long know how the small-scale details can mess up even a short-term forecast. Will end up for today by showing various model and guidance products for the approaching event. The above forecast is from the 06 UTC NWS NAM for total rainfall though 11:00 am on Wednesday the 23rd. Below is same forecast from the 06 UTC WRF-NAM at Atmo - showing much more, terrain-influenced detail and a very large range in rainfall amounts forecast. Above is same forecast from the 06 UTC WRF-GFS, with an even larger range of amounts in its forecast. Below is the current QPF guidance for Day 1-3 from the WPC national center. Even though we're inside the City of Tucson, there is abundant urban wildlife in this part of town - probably because of all the washes that feed down from the Catalina Foothills into the Rillito Wash. This morning I opened the backdoor to come over to our book casita (where I run Squid Ink Books) and surprised a herd of 10 Javelina chomping away on potted plants (they scared the heck out of me too). There were 4 little ones, 2 yearlings and 4 adults, and they drifted back and forth between the neighbor's carport area and the backyard around our casita. 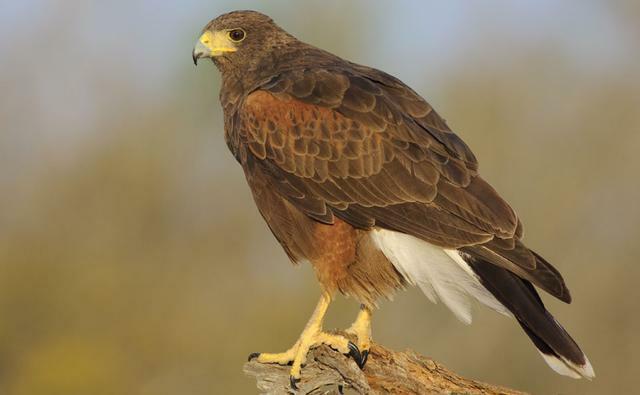 While I was keeping an eye on the Javelina, two beautiful Harris hawks flew in and perched on the casita roof and back fence and just watched what was going on. Photo above is from online stock - I didn't have my camera in hand when the hawks came in. About two weeks ago neighbor John Ferner caught a mother bobcat and her cub prowling through their yard during the night. Never a dull minute on our circle. 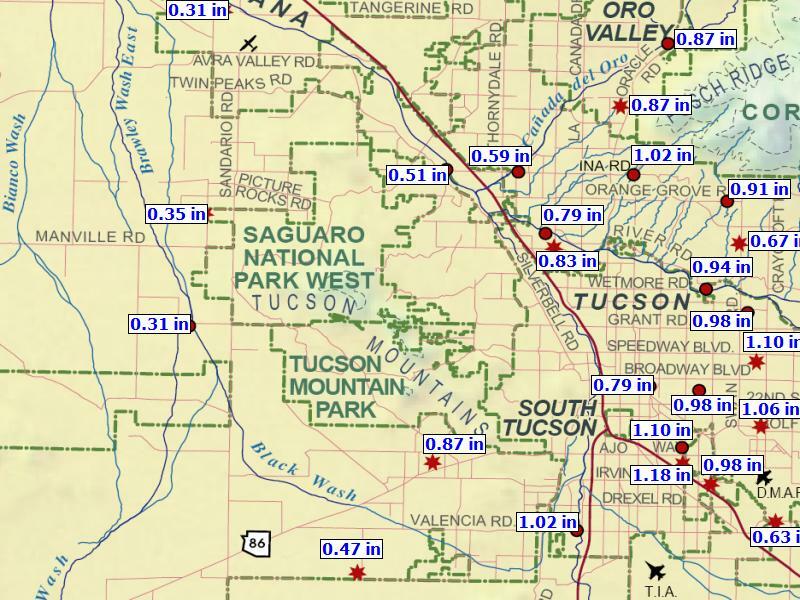 Various models continue to forecast a significant rainfall event developing for southern Arizona - there are timing and detail differences, but the potential appears to be increasing with each run of the models. Plot of CG flashes above (from Vaisala and Atmo) is for 12-hours ending 06 UTC last night. 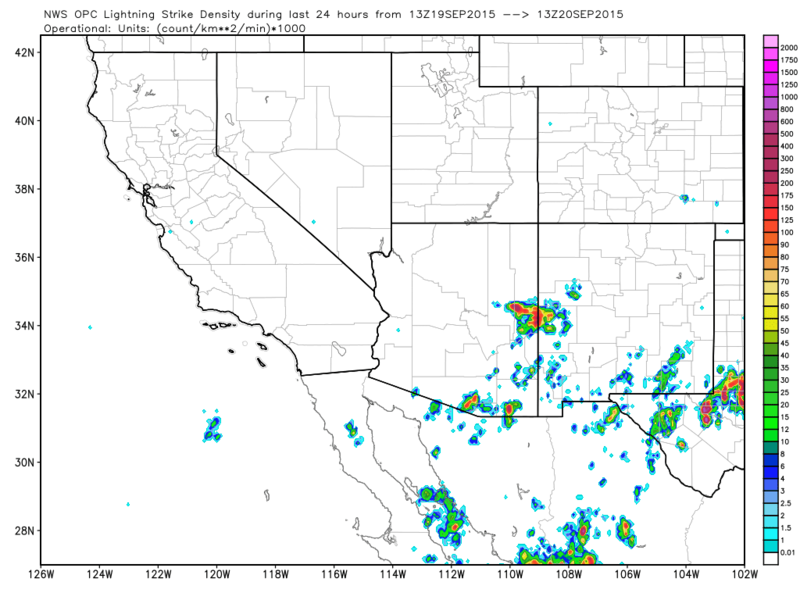 There were isolated storms over the southeast corner of Arizona yesterday, but they seem to have missed surface-observing sites. The eastern Pacific IR satellite image for 1330 UTC (below) shows deep cloudiness and cold cloud-tops stretching from the south end of GoC west-southwestward out to 120 degrees W. The subtropical disturbance associated with the eastern portion of the cloud masses is moving north-northwestward and will be the main player in our developing weather event, while a weak 500 mb cyclone west of Baja will be a second-string player. The GFS forecast (second below) of 500 mb features is valid at 12 UTC on Sunday morning and indicates the subtropical short-wave to be over northern Sonora and headed our way. As I said earlier, timing is an issue wrt the onset of the event here in eastern Pima County. The NWS forecast for the airport indicates a 10% chance of measurable rain tomorrow afternoon and night. However, the 06 UTC runs of the WRF model at Atmo are much more aggressive in the forecast for tomorrow. The WRF-NAM forecast of composite radar echoes (above) is valid at 4:00 pm MST tomorrow (the 19th) and its forecast of accumulated rain (below) is valid for period ending at midnight tomorrow. The GFS version of the forecast is similar. The WRF forecasts are sometimes too aggressive with the onset forecast, and I suspect that tomorrow will play out somewhere between the NWS and WRF forecasts. The longer-term WRF-NAM forecast for rainfall amounts on the 5.4 km grid (at bottom - for period ending at 11:00 am on 21 September) is quite amazing, with truly prodigious rain amounts forecast for Baja and across north-central Mexico. What, Exactly, Is A "Gulf Surge"